Rita Dove Sonata Mulattica. New York: W.W. Norton and Company, 2009. 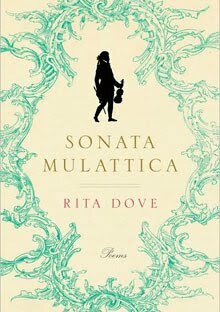 In Sonata Mulattica, Rita Dove uses a remarkable sense of empathy to create the voices an assortment of characters, from the prodigy violinist who is the inspiration for the title, to the King(s) of England, to the forgotten beggar/entertainer on the street. Through rich imagery and keen insight, Dove is able to use the scantest of facts in combination with her brilliant imagination to bring people long dead back to life. At a surface level, the volume is about the journey of a prodigy from fame to obscurity; at its core, however, it is an exercise in human compassion for a diverse range of figures. For example, in the short play “Georgie Porgie, or A Moor in Vienna” the child violinist, Bridgetower, has become a successful adult musician, gaining the friendship and admiration of Beethoven. However, when he engages in sexually charged banter with a barmaid who Beethoven is enamored with, Beethoven abjures him and destroys the dedication page to his Sonata No. 9 which would have solidified Bridgetower’s name and fame for all time. Dove is able to convincingly portray Bridgetower’s shock at being so violently cut off after successfully fulfilling his role as a court jester. Tragically, he is damned to obscurity for playing the character he was taught since childhood to embody in order to gain the approval of influential white royalty. This strategy, combined with his talent, secured his friendship with Beethoven before the same behavior destroyed it. After successfully giving voice to the anguish of a black man who must operate as a continual source of entertainment for those around him, Dove turns to the royalty who demand these acts. In the poem “The Regency Fete,” Dove gives insight into the mind of the newly crowned Prince Regent, son of George III. His notorious excess is the result of the belief that “love is/ an overflowing, an abundance one needs/ to be rid of, to pour into another. That other/ can be a man or a woman, dog or hillock…” Thus, Dove takes the reader from a seedy bar where a friendship is suddenly broken to a royal festival in which decadence reigns, and finally leaves the reader with a feeling that although gifted, Bridgetower never had a chance in a world ruled by privilege and excess.